Irishamericancivilwar.com is a website maintained by Damien Shields, a conflict archaeologist based in Ireland. 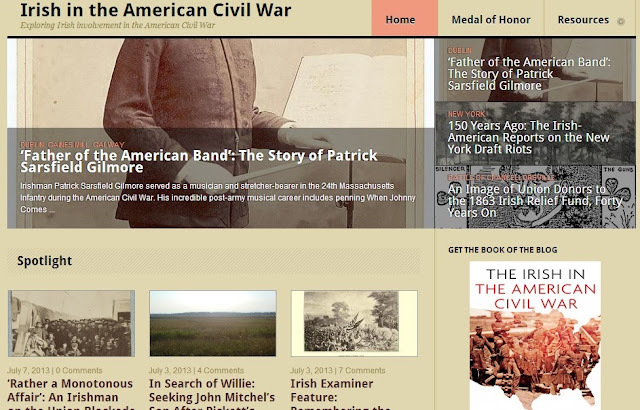 Many books have been written about the role of the Irish in the U.S. Civil War, but this website takes a holistic approach and has a number of aims: (1) to tell the stories of Irish men and women caught up in the Civil War; (2) provide information on different people, units and places; (4) provide resources for those interested in the Irish experience; (4) make some small contribution to raising awareness in Ireland of the Irish experience of the American Civil War. There are a number of excellent articles on the website such as The Ages and Origins of the Union's Irish Soldiers and Information Wanted: The Irish Missing and Disappeared of the Civil War. If his research sources contain the information, then Damien's articles refer to the place of origin for the men and women that he writes about. There is also an exhaustive list of resources to aid any researcher. Overall, this a very good website and a worthy stop for anyone who has Irish ancestors that fought in the Civil War. Labels: 1860s, Civil War, Expert, U.S.A.